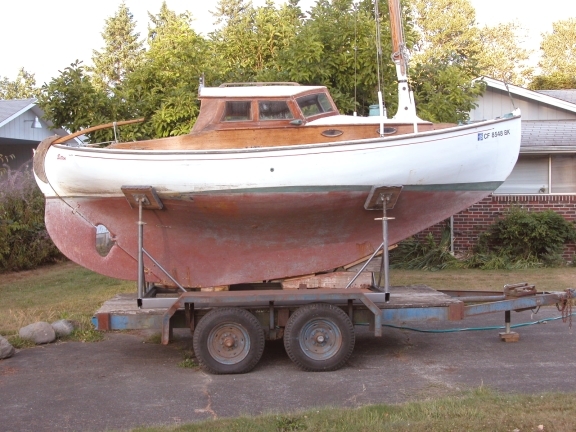 This story started with a boat that I found listed on Ebay some time back. The listing had been on-line for several days already and had only one or two days left for bids... but there were none! From just looking at the photos and reading the description, it looked like a boat that should have a story behind her and after more months passing and a totally unexpected email, it’s a fact - she does have quite a story and here’s some of the details to enjoy. I hope you’ll enjoy it as much as I am in being able to pass on the information. Says: Inspektion book for not-registrationbound vessels (except steamdriven vessels)..... in Danish. 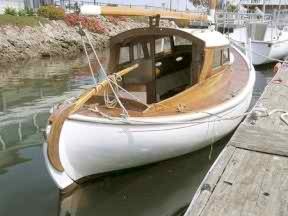 I ran across a couple of photos of our boat “Bitten” a 1933 Danish Spidsgatter on your web site when she was on Ebay Southern California. “Bitten” has a very long and colorful past that is well documented in her logbooks and also in the Danish Royal museum and newspapers. She was built in 1933 and launch in 1935 and had a very active life during the WWII years and remained active until this day. She was sailed by the then Crown Prince during the war years and was hands off to the Germans because of the occupation agreement and also had unlimited supply of petrol for her Dann 2-stroke inboard even when the people could not during the war. She was reported to have been sailed openly to teasing the SS in Copenhagen harbor, she participated in the summer 1943 evacuation efforts of the Jewish Danes. Bitten was hauled out at the Copenhagen Armature Yacht club and her lines were taken by a local yacht designer who wanted to build one fiberglass as that was the cutting edge thing in the late 1950’s. 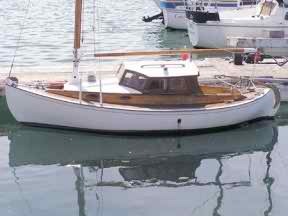 Currently Bitten is having her engine rebuild, new keel bolts, toe & rub rails and rigging replaced. 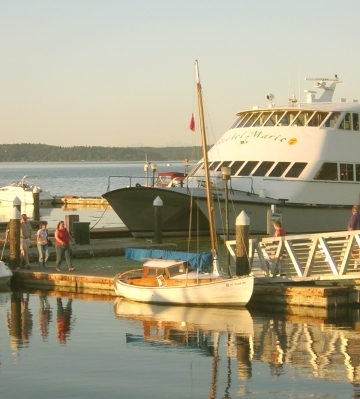 She is scheduled for a re-launching for her 75th Birthday in the Spring of 2008 in Gig Harbor or Port Townsend, WA. Maybe there will be a fleet of Nordica’s and Halmans on hand to welcome her back in the water... I doubt if “fleet” is the most likely word to apply her, but it’s a good thought anyway. So here’s how this story began unfolding for me.... with the help of her new owners - Vernon and Debbie Moore of Port Townsend, WA. We two fell in love with her at first sight down in San Diego some 5 years ago while seeing her sitting on the hook right in front of Shelter Island. Just one of those little boat that you could tell she would be a hoot to have. At the time I was doing a sea trial commissioning of a new oil tanker Alaskan class that was being built at NASSCO in San Diego and no one we asked knew anything about the little boat or showed interested in helping us. 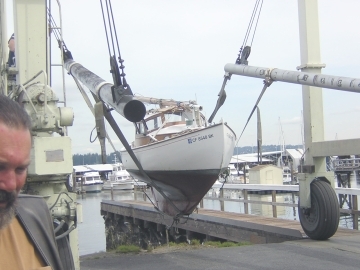 Being a boat lover, these things happen and the case was closed, but every time in was in town I would drive over to see if she was still on the hook and most times she was but that was the end of it. Last July, I was on my homeward commute home on hwy 16 just out of Gig Harbor heading toward Tacoma and sitting backed up in traffic waiting to get over the bridge was Bitten on a trailer. A not so quick 180, 3 exits away a short pursuit took place and I was dumb founded to discover that she gave me the slip!!!! It took two weekends and pounding the marinas and such to no avail and I was about to give up where she appeared on a Port Orchard Yacht brokers site to $10,500.00! Well, we were in love but to that much? 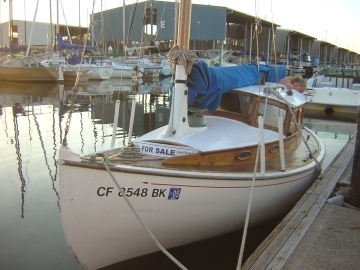 We took a look and poked and prodded her while she in the water and having owned a few wooden boats over the last 30 years we knew what we where looking at money wise and work wise but just couldn’t bring ourselves to pay 10K for her. At this point we had been told about the logbooks as far as have a “Very Well Documented past” but still didn’t take any of this into account. The broker was hounding us to make an offer around the $10K mark and after great sole (and soul) searching I told him we couldn’t come close to that. After a few weeks we found her listed on Craigslist for $6800.00 but this time by the owner who brought her up from San Diego. Can you say speed dial!!! We meet at the boat and the owner turned out to be an older guy that was relocating to the area with 2 boats and trying to sell a house in CA and also building a new one here, and just wanted to sell her for the money. The good news is he also wanted to see her go to someone that really wanted her and knew what they where getting into! The dance started and a few weeks passed and he had to depart back to CA for a few weeks, so all in all he didn’t want to let a 74 year old boat set in the water in a town he didn’t know for weeks on end un-attended and he called me up and in the end we got her for $3500.00. Was $3500.00 too much? Not to us! We where absolutely speechless when we did all of the paper work and he produced a hand stitched blue cloth covered logbook. Some loving owner before had made this little cloth book cover with her name “Bitten” hand stitched on the front. Within this cover was her original “Inspection Log Book” that has every page intact still with the string that pass though every page and is red melted wax sealed in the back with the Royal Maritime Minister stamp melted into the wax. The inspection log covers her keel being laid in 1933 to the launching inspection in 1935 and also covers the war years and after in Danish up until 1960, then it shifts to English by her American import owners thought 1973. Then another old school style composition book picks up but not as detailed and over the years covered it gets rather scratchy in the late 1980’s. There was also the original Kermath Sea Pup engine manual and brochure from where the Kermath was installed in Denmark in 1956 as indicated in the logbook. Right now one of my friends and colleages in Denmark is working with the Royal Maritime museum in doing a translations of her logs and also interviews of one of her Danish owners sons to write a short official history on her WWII part. He is the one that discovered the newspaper article in the museum about her export and 1943 endeavors. There’s more to come but the museum staff is slow to release anything to do with the war as they are not so proud of the occupation years. Please check back from time to time when you log on to the site and when there’s some additional news from the translations or from some new photos, we’ll continue the story. For those who may not know about it, the “Wooden Boat Festival” in Port Townsend, Washington is one of the premier shows to see ships of all sizes, craftsmanship that you thought was gone and meet the most interesting people in the world.